Both olive oil and rosemary are prevalent ingredients in Italian cooking. What could be better than creating a tasty marriage of the two? Olive oil is considered a healthy oil because it is full of monounsaturated fat, which can lower your risk of heart disease and reduce your bad cholesterol levels. The aroma of rosemary is spicy and warm, and its needle-like leaves add a zing to any dish. Infusing olive oil with herbs is a simple process that almost anyone can do with a little practice. Clean and dry your rosemary. Wash the herbs with a slightly damp washcloth and set them aside to dry. You don't want any water on the rosemary because the salts in the water will break down the herbs. Warm your olive oil. Pour your olive oil into a small sauce pan and heat it over a low flame until it is warm. The warming process should take just a few minutes. Remember, you want the olive oil to be warm--not hot. High temperatures destroy the healthy properties in olive oil. Put your rosemary into a bottle or jar that holds 1 pint. Remember that a little bit of rosemary goes a long way, so there is no need to stuff the bottle full of this herb. Pour the warm olive oil into the bottle. Put the bottle aside to cool. Seal the bottle with a lid or a cork. Set the bottle in a dry, cool place with no direct sunlight for at least one week. Decide whether you want to strain the rosemary out of the oil. 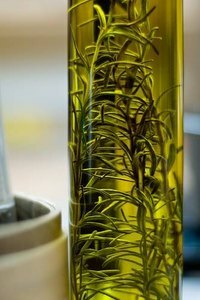 Many people leave the rosemary leaves in the oil for a decorative touch. If you prefer to strain the olive oil, however, simply pour the oil through a strainer into a clean jar or bottle. You now have finished infusing olive oil with rosemary. Enjoy your rosemary-infused olive oil. This oil is perfect for drizzling on salads and fresh bread. You can use the oil to flavor potatoes and pasta dishes. You can also try marinating chicken and fish in the oil for a little extra flavor. For variety, try adding two cloves of fresh garlic and 2 tsp. of black or white peppercorn to the oil mixture. Keep in mind that any infused oil containing fresh garlic should be used immediately to avoid getting sick. Try bruising or mincing the rosemary leaves for extra flavor and aroma. Homemade oil doesn't keep as long as processed oil. Use your rosemary-infused olive oil within two months so it doesn't spoil. A super simple DIY to make your own infused olive oil! Perfect hostess gift that's so easy, anyone can do it.